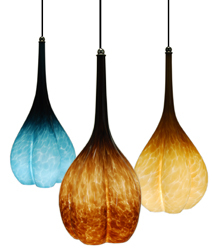 The natural environment of the San Francisco Bay Area has always been Guy Corrie’s favorite source of inspiration, and this family of hand blown glass accessories, table lamps and light fixtures was designed to reflect his surroundings. Organic shapes, rich earth tones, and the bright colors of the California hills come together in the Morph Collection. 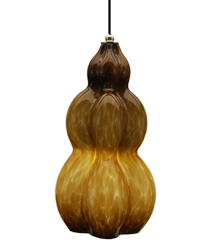 Using Guy’s proprietary techniques, each vase, bottle, lamp and light fixture is hand blown here in our Richmond studio. 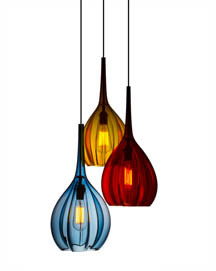 Due to the special processes involved in creating the glass, each piece is unique in shape and color, making this one of the most unusual designs in the industry. Choose from the smooth, slender lines of the Morph Pendant fixture and the Pendant Table Lamp, the sculptural flourishes of the Pod Table Lamp, or the voluptuous shape of the Bottle vases and Bottle Table Lamp. 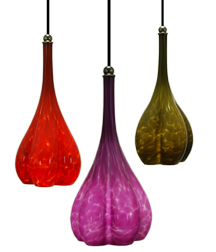 With eight different color options to choose from, these pieces add grace and intrigue to a variety of interior environments, and look particularly stunning in arrangements of various shapes and colors.